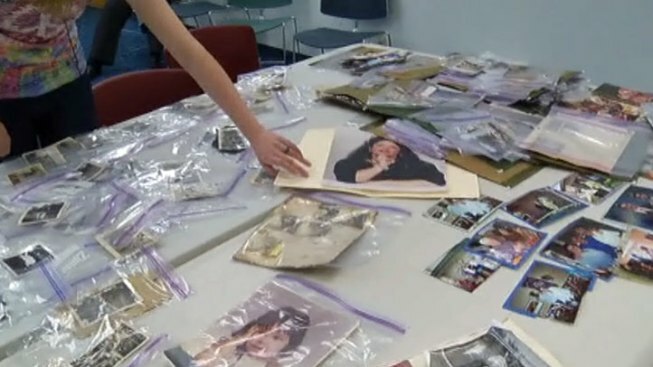 A project at an Arlington library aims to reunite people with family photos lost in last month's tornado. The Tornado Lost and Found Photo Project at the Lake Arlington Branch Library collects, cleans and catalogs pictures in hopes of reunited them with their owners. "A picture says a thousand words? Actually, it says more than that," said Kate Atwood, who started the project. The project has pictures of fathers and sons, mothers and daughters, grandparents, husbands, wives, friends, brothers and sisters. There are pictures that date back to the early 1900s, pictures in color and pictures in black and white. "Pictures are memories, and pictures are people's lives, and sometimes they're the only way to document a person," Atwood said. Hundreds have been turned in, and hundreds have been claimed. "This is little me," said Jarred Osterman, holding up a picture of himself as a 5-year-old that he found at the lost and found. Osterman and his family found 250 of their pictures at the library. "We were going through them thinking, 'Wow we're finding this many pictures,' and 'Oh, look at that time where we did this and this.' But to find 250 pictures is just crazy," he said. "There's weddings, birthdays, Christmases -- all that stuff you cannot replace," Osterman said. "You can replace the broken windows and the broken fence, but there's no replacing Christmas." While some pictures are ripped and torn and others are smeared or curled, the stories behind each one endure -- even if some of those stories are fiction for now. "Ernest Hemmingway, that's what I call this guy," said Atwood, pointing to a black-and-white image of an unidentified elderly man reading a newspaper. "He just seems like a poet." "This one looks like a1940s Glamour Shots [photo]," she said about another black-and-white picture. "She just seems like she'd be a singer or something in a jazz club."